Pomegranates are one of the things I love about winter. They are beautiful, festive, and delicious; not to mention packed with healthy antioxidants. 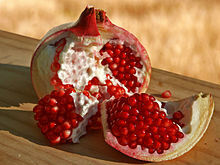 Pomegranates originated in the modern-day country of Iran. For centuries they have been used in the Middle-East and Mediterranean regions of the world. Today, most of the pomegranates we eat in the United States are grown in California and Arizona. We use them in salads, juice, smoothies, wines, and baked goods. Personally, I am happy just to eat them plain! One of my favorite winter snacks is bowl of fresh pomegranate seeds. The only thing that bothers me about pomegranates is how difficult it can be to remove the seeds. It is messy and time-consuming. I recently came across a "pomegranate deseeding tip" that has helped me out tremendously! In fact, it's so easy I wonder, "Why didn't I think of that?" 1. Cut your pomegranate in half horizontally. 2. 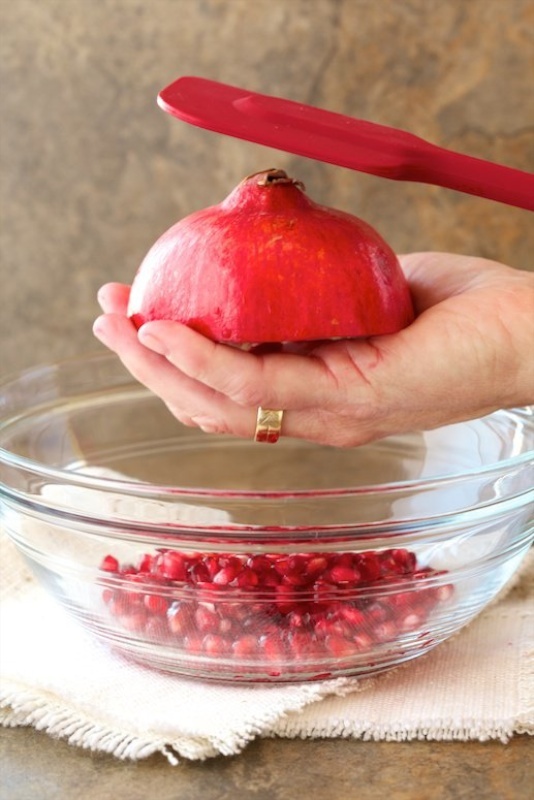 Hold one half of the pomegranate, seed-side down over a bowl. Hold it so your hand is underneath the seeds with your fingers spread slightly apart. 3. With a wooden spoon, whack the top of the pomegranate. If you hit the pomegranate hard enough, the seeds should start to fall through your fingers. 4. You may need to whack it several times until all of the seeds fall out. That's it! It can be done in less than a minute. Now you will be excited to enjoy even more pomegranates this holiday season. Here is an easy recipe for a holiday salad topped with pomegranates. Wash the lettuce and spinach. Chop or tear the lettuce into small pieces. Mix the lettuce and spinach in a large salad bowl. Toss the lettuce and spinach with the pomegranate, almonds, and feta cheese. Add desired amount of poppy seed dressing.